Community Q&A Question: What power improvement? Can anybody say how much horsepower you can get with this Mustang Custom Tune on a GT equipped with a cold air intake kit? Do you increase or lower fuel consumption? 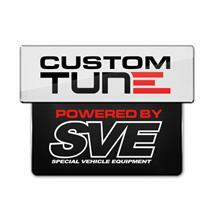 If driving with economy in mind, an SVE tune will improve fuel mileage over stock in the same driving conditions. Because of its performance nature, fuel mileage will be reduced under performance driving compared to stock. Power gains will be dependant on what CAI you have, but typical gains on tune only are between 15 and 20 on horsepower and torque.